May 1st, Labor Day, is an occasion for us to talk about working conditions in Bolivia, whether regular work, informal jobs or even child labor. In spite of workers’ disputes and union movements having achieved minimum rights, such as a maximum number of hours per day (eight), a minimum number of days vacation per year (15 working days) and a minimum monthly salary (currently Bs. 680 equivalent to €72, while in 2005 it was only 440 Bs. 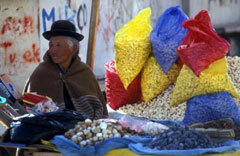 or €46.50), many Bolivians work longer hours for a smaller salary. 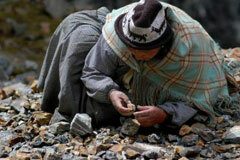 Formal work (official) is available to around 40% of the Bolivian population, most of them men. However, in spite of the work being recognized, it may still be unstable and sometimes in difficult conditions. Informal work is the most significant involving around 60% of the mostly female population. There are small businesses, street vendors, plumbers, electricians, domestic employees, housekeepers, etc. everywhere. All of them are in unstable situations and sometimes living under difficult circumstances. Nevertheless, a great many Bolivians survive thanks to informal work, which also has the advantage of their being their own bosses. A person can get far starting with practically nothing. 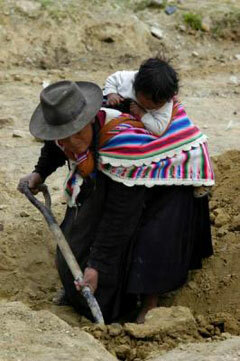 In Bolivia it is common to see children working. They shine shoes in the big cities, work as “announcers” on minibuses by announcing bus destinations and collecting fares; they bag purchases at the supermarket or sell candies on the corner. Most of the children working in the city work in the tertiary sector. Principal employers are private homes, transportation and business services. Depending on the sector and age of the child (between 10 to 14 years), they may earn an average of from Bs. 181 to 256 (around €19 to €27 for an average of 27 hours work per week. Child labor often scandalizes westerners since in the child-king model of society it is inconceivable that children should work or have responsibilities. However, looking a little more in depth, one realizes that making children work is a model for a different education which does not necessarily exclude taking into account working conditions and the real learning they achieve. In the countryside, making children work is a millennial educational model that is still in practice. In Bolivia, the rural child population is a high percentage of the population of economically active children, around 80%. This is due to an Andean cultural context wherein agricultural work is part of child’s training. There is a consensus on the idea of work as learning, forming an integral part of daily life. In the countryside learning is doing, by practice and not by studying as in the western model. When people from the countryside emigrate, they take this model with them, which is incompatible with the mainly theoretical educational system in the cities. They promote child labor in this other maladjusted context and under difficult circumstances. This aspect goes hand in hand with the poverty that greatly affects this part of the population, which is weak and finds itself not fitting in with the needs of urban life. The situation gets even more complicated since the families are often large. It is common for the older daughters to take care of the younger children and to complete daily chores in the home while the boys go to work in the street, sometimes taking the younger siblings along to teach them to work. The Bolivian work tradition makes us re-think our ideas of “labor” and “child.” According to the Andean culture that is still inherent in the countryside, child labor forms part of learning about life and each individual’s socialization. According to the International Labor Organization, “work done by children in agrarian societies is part of their socialization and is a way to transmit knowledge and experience, traditionally passed down from father to son.” It is an essential element of the family’s survival in rural areas. But it does not interfere with taking into account a certain equilibrium and, above all, access to safety, hygiene and schooling. The difference in the concept of children is also quite strong. If we seek an Andean definition, we would say that being a child means “forming part of a family that does not conceive of an existence outside its being part of a community that protects him.” Likewise, the child has to contribute to the well-being of the family which is part of his training, whether taking care of the goats, looking after siblings or participating in household chores. There is a specific task for each age that enables acquisition of traditional knowledge, growing as a human being and, above all, becoming an integral part of the community. 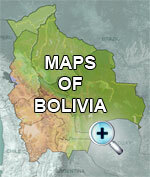 In general, in Bolivia the community aspect outweighs private interest.